On the August 13th one Aquatic warbler individual was caught in Belgium. This juvenile was ringed in Belarus during the search of nests for Aquatic warbler translocation. Nest of the bird and two of his siblings was found in Zvanets swamp in the beginning of June. Chicks then were 6-7 days old. Specialists decided to leave the nest with 3 chicks and search for nests with more hatchlings. So, these birds were left to grow in Zvanets swamp. Now at least one of them is traveling to his wintering sites. It is probable that Aquatic warblers which were translocated to Lithuania, Žuvintas is migrating or at least is getting ready to migrate also. Scientists are waiting with eager for any information about migration of translocated Aquatic warblers or the ones that have geolocators on them. Translocation of Aquatic warblers, search of nests in Belarus, Zvanets. The bird was caught in Veurne, Province of West-Vlaanderen. Ring information: MINSK KA38792. 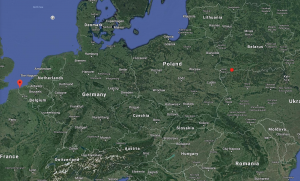 Red circle marks the place where the bird grew up (Zvanets peat in Belarus) and the red pointer – a place where bird was caught (western Belgium).